Pray-as-You-Go has released the second in a planned series of imaginative contemplation exercises. Listen to it below; it’s the story of the woman with a hemorrhage. You may recall that’s the Gospel story that finds Jesus in a crowd, but asking “Who touched me?” when power goes out from him. An exercise based on Jesus and Zacchaeus is also available, and Jesus and Bartimaeus is expected next. If you’re receiving this via e-mail, click through to listen to Imaginative Contemplation with Pray-as-You-Go. What a wonderful experience! I hope that there are more of these will be offered. My phone is for my safety and not too smart. Any chance you could have the Pray as you go as an app like the 3 minute retreat? Thanks. Caren, Pray as You Go is available as an app. 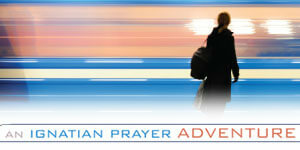 The links to format choices are here: http://www.pray-as-you-go.org/home/.